It’s a drizzly spring day here, making it perfect for getting all the indoors tasks that I’ve been avoiding while the weather has been fine off my checklist. I’ve baked, done laundry, tidied up, and now with the house ready to tick along for another week I’ve turned to online things. I managed to update my travel blog (with a piece about a Czech spa town I visited last autumn, if you’re interested) and, finally, I sat down and caught up with my reviews for A Century of Books. The impact of this behaviour on their relationship is predictably awful. And Gilbert is no better, going off and having an affair right under her nose and expecting to receive no criticism whatsoever about it. The most hopeful moments are when it seems like their marriage will break up. Which it doesn’t, frustratingly. Four Gardens by Margery Sharp (1935) – After a wonderful encounter with Sharp earlier this year (when I read The Flowering Thorn), I was keen to read more by her and Barb, my favourite Sharp expert, recommended this (one of her own favourites). And it was absolutely lovely, telling the story of Caroline Smith from young adulthood to widowhood traced through the gardens she has made. It is much quieter and gentler than I’ve come to expect from Sharp but no less excellent for that. If only it were in print and readily available! “It’s only a temporary measure,” they said, “until you find your feet.” They had a touching and totally unfounded belief that I was destined for better things. It was a temporary measure that was to last ten years. Newby would eventually go on to become a great travel writer – perhaps not quite the “better things” his parents had planned – but learned much during his decade dealing with buyers, models, and others up, down and around the British Isles. With a great sense of humour and obvious affection he recounts those days in this wonderful and highly enjoyable memoir. Hughes got it wrong, in one important detail. You will have read, in Tom Brown, how I was expelled from Rugby School for drunkenness, which is true enough, but when Hughes alleges that this was the result of my deliberately pouring beer on top of gin-punch, he is in error. I knew better than to mix my drinks, even at seventeen. Taking the villain of Tom Brown’s School Days for his (anti-)hero, Fraser sets about to show “how the Flashman of Tom Brown became the glorious Flashman with four inches in Who’s Who and grew markedly worse in the process…” and does it with great style and an even greater sense of humour. We follow Flashman from school to the army, which tosses him from Scotland to India to the dangerous Afghan frontier. His unapologetic selfishness and cowardice bother him not at all and, more often than not, are taken for the reverse by his obtuse comrades. With quick wits and flexible morals, he not only survives his early adventures in Afghanistan but comes away a hero. And so the legend and fame of Flashman begins. His further adventures are chronicled in great detail in 11 further books and I can’t wait to read them. She observes herself with a certain cynicism: a woman of thirty-five, handsome in her way, charged with undirected energy, a fatalist and insufficiently charitable. In another age, she thinks, there would have been a vocation for a woman like me; I could have been a saint, or a prostitute. Even months after finishing it, I’m still working out my reaction to this one. Claire, I’m finding the same thing–I don’t mind the reading–it’s all I can do in the afternoons and evenings anyway with the level of fatigue I deal with. The writing is much harder to keep up (especially since I’m more engrossed by writing a series of posts about songs about heaven). I’m starting to think I won’t make the 100 books though–any ideas about finding books to fill in the year gaps that I have? My list of books read so far is at https://melodylibblog.blogspot.com/p/blog-page.html. It wouldn’t be a challenge if it was easy, right? But don’t worry too much over it; if it takes you more than a year, that’s what it takes. Most people who have done the challenge in the past have spread it out over two years. As for ideas, may I recommend combing through other book blogs? 😉 That is where I have gotten most of my inspiration. 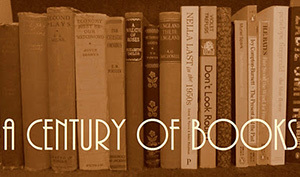 For quicker suggestions, look for book bloggers who compile their reviews by year of publication. I do this and so does Barb at Leaves & Pages. I find it’s super helpful. Claire, thanks so much for the helpful reply. I forgot you listed yours by year, and I’ve found several good possibilities on Barb’s blog which I had never seen before. If others have found good middle-brow lists by year, please reply! I also have a couple more Persephone books I want to read this year and I think those will fill some gaps in my list at https://melodylibblog.blogspot.com/p/blog-page.html. Other good middlebrow blogs are http://furrowedmiddlebrow.blogspot.co.uk, https://northernreader.wordpress.com, http://www.stuckinabook.com, https://beyondedenrock.com/?s=1936 I’m sure there are many more but these are blogs I’ve used for ACOB. Grier, thanks so much for these–they look like amazing sites where I’ll find TOO much to read!! What a beautiful painting! And hurrah for Literary Lapses – probably still my favourite of the Leacocks I’ve read. It’s a particularly good Leacock, isn’t it? I find his work is usually predictably good and even (unlike our friend Mr Milne) but this one especially so. I plan to complete the next three decades in the next few weeks. I like seeing what others are reading. It’s not updated remotely as frequently as this blog but yes, it exists. I hope you enjoy it! As for your Century, it sounds like you’re doing amazingly well! I am lagging behind schedule this year as I keep getting distracted by other books (only 26 of the 62 I’ve read this year have been for ACOB). Whoops. But there’s plenty of time still left in the year. Thanks for the suggestion on Leacock’s Literary Lapses. I could not find the book in any library catalog in my area, but did locate a free copy for Kindle on Amazon, so I downloaded it. Light and interesting so far. Wonderful! I’m glad to hear you’re enjoying it. And there’s certainly a lot more Leacock to discover (mostly available free online) if you find you like him. The Leacock one looks like fun! I just downloaded the free version to my Kindle. I’ve only read Sunshine Sketches of a Little Town, which made me laugh to tears. The Leacock is very fun and it’s one of his best. If you liked Sunshine Sketches I’m sure you’ll enjoy it, too. As for Heyer, I’ve never managed to pick just one favourite. My top three are A Civil Contract, The Grand Sophy, and Sylvester (with Frederica coming a very close 4th). I like your blog as you are never afraid to state your own mind.